Plantation Style Home surplombant la plage à couper le souffle ....... Total Privacy !!!! Casa Tua Exuma Villa vous ravira avec des vues spectaculaires et le chœur apaisant des vagues se brisant sur notre plage de sable blanc ivoire. La villa est entièrement privée sans être isolée entourée par de magnifiques plages et forêts vierges, mais à seulement dix minutes en voiture de Georgetown sur un chemin facile, bien pavée. Et après avoir profité de restaurants et de boutiques du centre-ville, vous pouvez facilement revenir à la sérénité de votre propre villa privée. L'île de Great Exuma est l'un des joyaux des Caraïbes et est facilement accessible à la fois aux Etats-Unis et en Europe. Niché dans un cadre confortable et détendue, Casa Tua Exuma Villa est une propriété colorée, situé sur Queens Highway face de la plage, entouré par une végétation luxuriante et les couleurs vibrantes des Caraïbes. Surplombant les eaux cristallines de Exuma Beach, cette villa propose un hébergement confortable avec une vue imprenable de tous les angles imaginables! Simplement se asseoir sur le balcon supérieur et regarder levers de soleil spectaculaires, pleines lunes et des étoiles filantes. Nos clients peuvent profiter d'un terrain de volley complet sur la propriété, et de grands parasols et des chaises sont disponibles à côté de la cour pour regarder tranquillement pendant les matchs. Casa Tua Exuma Villa est un établissement unique, vous donnant le meilleur que la Grande Exuma Island a à offrir ... les belles plages, la nature sauvage, et les alizés constants de refroidissement. Ce est une base idéale pour explorer l'île, ou tout simplement rester sur place et de se complaire dans les sons de l'océan et de la caresse de la brise de mer. Les clients doivent fournir leurs propres articles de toilette, par exemple ..... papier de toilette, shampoing, savon de bain, etc. Great Location with everything needed! We just got back today from our stay at Casa Tua. The house was as described with 3 bedrooms and 3 bathrooms. Do note that it might not be the best situation for families with small children as the only staircase to the lower bedrooms is outside but we had our baby monitor with us and made it work. There were also a couple of air mattresses and extra bedding so if 3 beds don't work for you, there is extra sleeping space. There were two issues with the home when we first arrived and Carlos called me personally that night to confirm that repairmen were scheduled for the next day and then again the next day to ensure that our first night was satisfactory. All repairs were made the following day and then there were no other problems; he was EXTREMELY responsive. The home is a very short walk from what can only be called a deserted beach. There are no other homes in the area and is not a public beach access point so most of the time, there is no one there. It is right near the airport and in fact even a novice driver on the left side of the road can be there is less than 5 minutes. It is also centrally located on the island so the trip to Williams Town is almost equal to Rolleville so whether it is Tropic of Cancer or Cocoplum, you are about equal distance away. This was our third time on island in the past 7 months and we would definitely stay at this home again! The house was centrally located on the island which was perfect for exploring and close to the airport. It had all of the amenities we needed and with the beach right across the street, it was super easy to go for a run/walk on the beach at any time. Carlos was a great host too! Great having you guys......glad you enjoyed !!! Wonderful home and only steps away from the beach! we were very pleased with the location of this home! 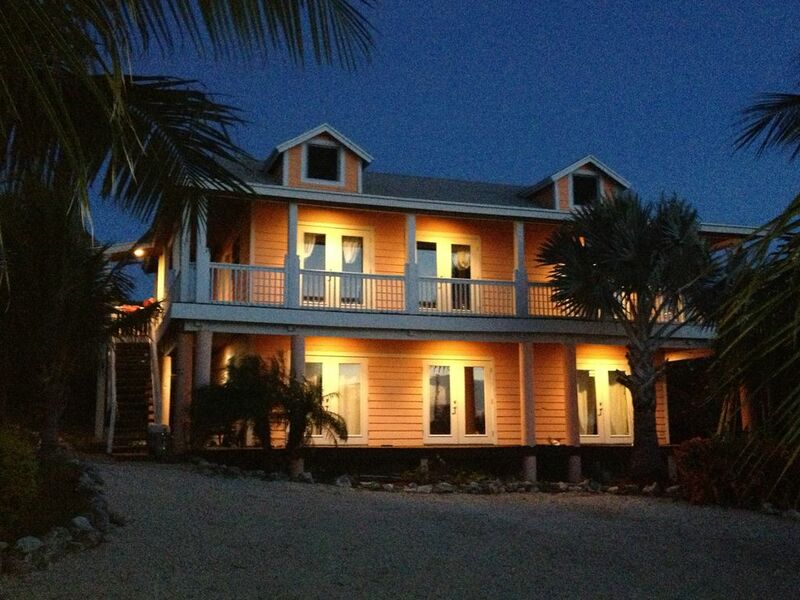 Very central in relation to all the things you will want to do while in exuma. We loved the porch where we could sit and enjoy the views and it was wonderful to have the beach just steps away. We would definitely stay in this home again. Also Carlos is very easy to communicate with and took care of anything we asked. We were a group of 3 couples visiting Exuma for the first time. We loved having our own bedroom and bathroom. We took advantage of the large kitchen area to make several meals after visiting the various local grocery stores. Watching the sun rise and set off the deck was something else, too. The access to the beach was a huge plus. We walked the beach practically everyday and found it to be the best on the island (in our opinion). We rented a van to get around which is a must, rented a boat one day to explore the snorkeling areas around Elizabeth Harbor, went on a reef fishing excursion, and spent a day excursion to see the iguanas, sharks, swimming pigs, Thunderball Grotto, and sand bar. Exuma was a nice vacation away from our Montana winter. Perfect for Three couples with in suite baths. Everything you need. The owner, Carlos was great. Casa Tua Exuma Villa est entourée par certaines des eaux les plus spectaculaires du monde. Vous pouvez profiter de miles et de miles de plages spectaculaires et de longues barres de sable, qui sont parfaits pour explorer. Laissez tomber vos cheveux et profitez de la diversité des équipements Exuma. Profitez des joies du jet ski, du kayak, du paddle board, du kite-surf et, bien sûr, de la pêche et de la plongée. Des excursions quotidiennes d'Ocean Safari et Eco-Tours sont disponibles pour toute la famille. Elizabeth Harbour, non seulement est spectaculaire dans la beauté, mais permet le transport quotidien pour des excursions d'une journée vers les îles éloignées pour le plaisir et le soleil. Nous avons une liste complète des informations nécessaires pour votre séjour à la Villa. Si vous avez des questions, notre directeur de villa est disponible 24 heures. Check-in 2:00 PM and check-out 10:30 AM Call Elizabeth when you are leaving. We give discounts to returnees. Above 8 guests: $125/person/week up to a maximum of 12 people.